Need a New Dinner Idea? A few nights ago I was in need of a change in my typical run of the mill dinners. Did you know that most people just have a rotation of 20 foods that they really like to eat? Well, I had hit my 20 limit and I really needed something to spice it up! You might be wondering, “why use spaghetti squash?” Well I use it as a substitute for pasta because I cannot have pasta. It causes too much of a spike with my blood sugars and just isn’t worth it for me. Did you know that using spaghetti squash vs pasta can save you roughly 200 calories and 30 carbs per serving? 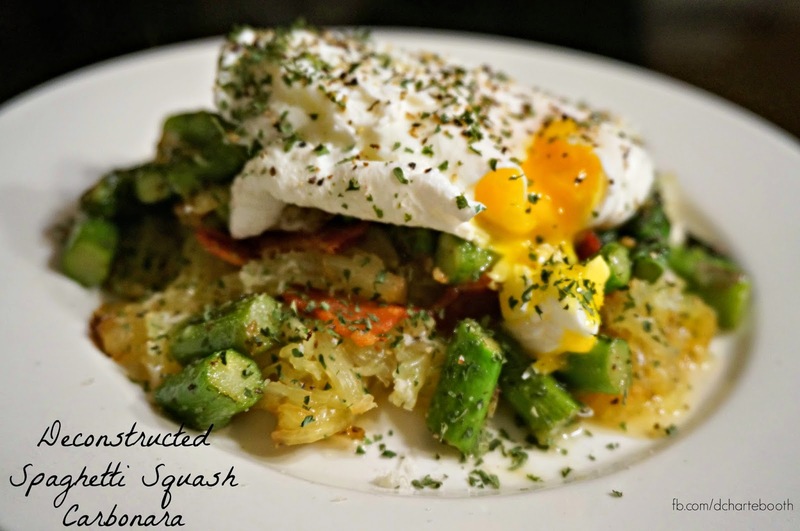 So in our home we typically use zucchini noodles or spaghetti squash and they work wonderfully! OK, OK, what you all want is the RECIPE to this beauty! First, preheat your oven to 400 and line a baking sheet with foil. Cut your spaghetti squash in half and remove the seeds. Sprinkle with olive oil, salt and pepper and place it cut side down on the sheet. Bake for 30-40 minutes, until the squash is tender. While the squash is baking, chop up the onion, asparagus and the bacon. In a medium pan, fry the bacon ( you don’t need to add any oil or butter), remove bacon and then cook the onion, minced/pressed garlic for 2-3 minutes then add in the asparagus. Cook until the onions are translucent and the asparagus is tender and bright green. In a separate, non stick pan, you will need to poach your eggs. Here’s a link how to do it! This was actually my first egg poaching experience! Use a fork to shred the squash. Assemble your plate, squash first, then bacon, asparagus/onion mix, Parmesan cheese to taste, then egg. Sprinkle with S&P and parsley and ENJOY!!!! Why Paleo with Type 1 Diabetes?